Cards from a Russian standard woodblock and stencil pack of circa 1820, which are a Russian version of the double-ended ‘Paris’ pattern from France which was being adopted by many European manufacturers at that time. 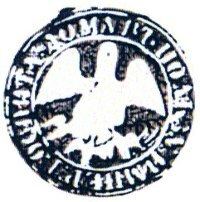 The ace of diamonds carries the tax stamp showing a pelican with outspread wings over a nest. The money raised by this tax went towards supporting the Imperial orphanages and funding the education and training of the foundlings. This tax stamp disappeared with the advent of the Revolution in 1917. 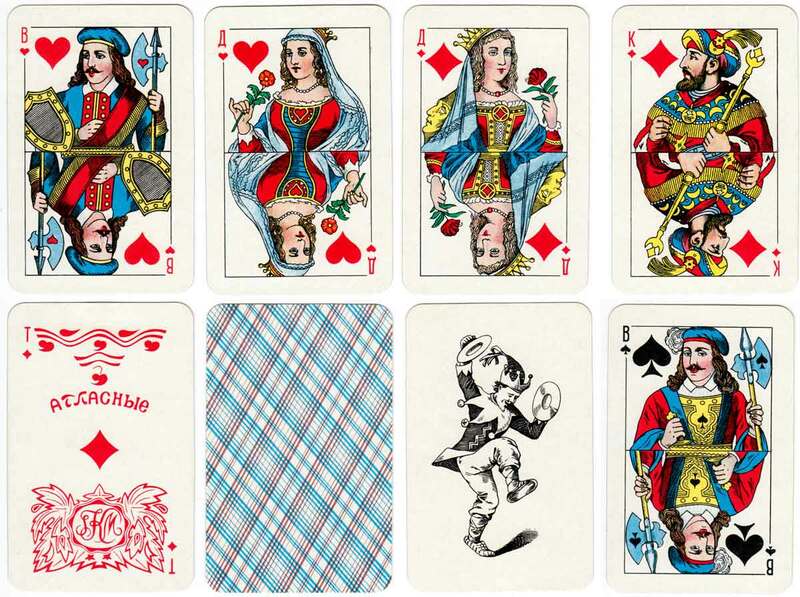 After the USSR ended and the Colour Printing Plant closed down, several small firms started to print playing cards, including modern versions of this deck. Above: cards from a Russian standard woodblock and stencil pack of circa 1820. Image courtesy Dudley Ollis. 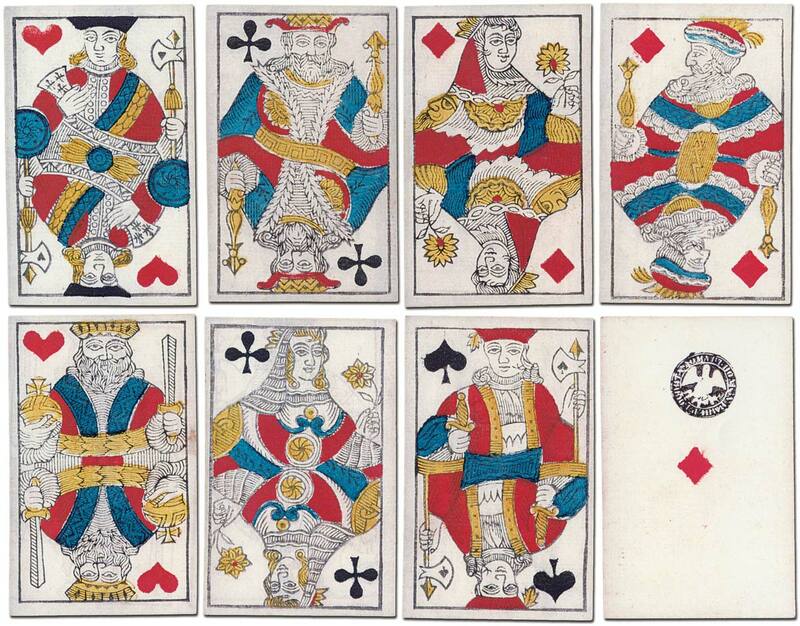 Many modern versions of this pattern are printed today in Russia and elsewhere, usually including a joker card. Cards manufactured in China with Russian patterns have been taking over the market but in some cases the quality of the cards is not as high as the original Russian-manufactured versions. 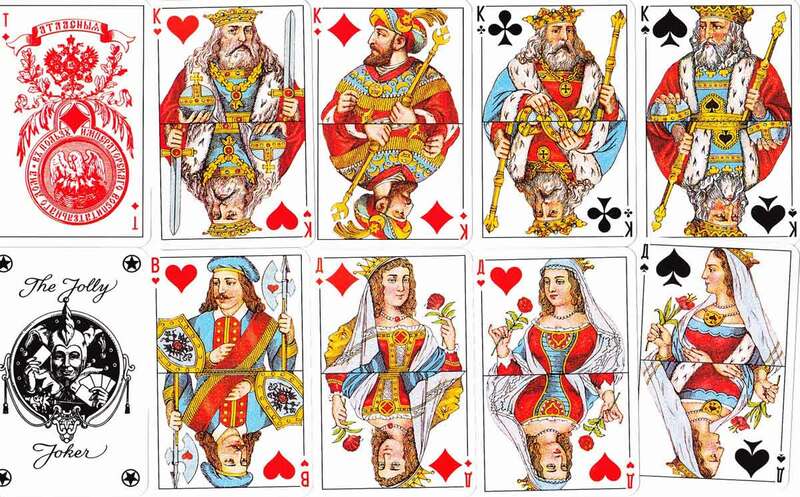 Above: cards from a Russian standard pack. Image courtesy Rex Pitts.